A special thank you to NetGalley and Harlequin Canada for an ARC in exchange for an honest review. Clara Solberg and her husband Nick seem to have it all—a great marriage, two healthy children, and a successful dental practice. That is until Nick and the couple's four-year-old daughter, Maisie, are in a car accident that claims Nick's life. Clara is only a few days postpartum and her emotions are running the gamut from shock, grief, confusion, disbelief, and now paranoia that is fuelled by Maisie's night terrors of "the bad man". Although the crash is ruled an accident, that Nick was speeding and lost control, Clara can't stop obsessing that Nick was run off the road. It is here where Kubica turns truths into lies, and secrets start to take flight. She is a master at this genre. Told in alternating perspectives of Clara in the present day, and Nick leading up to the accident, Every Last Lie accelerates in pace and suspense, but ultimately stalls out at the end. 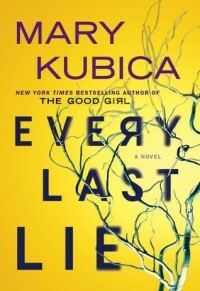 Unfortunately with this ending, Kubica negates all of the suspense and build up she so masterfully weaves throughout. That being said, I would still recommend the book and any of her other works.